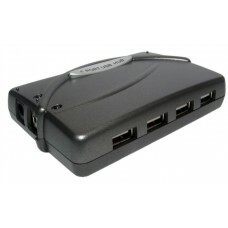 The USB2-222 is a 4 Port USB 2.0 Compliant Hub allows up to 4 USB 1.1 or 2.0 Devices to be connected to you computer. It supports the High Speed transmission rate of up to 480 Mbps and is fully backward compatible with USB revision 1.1 devices. The USB2-222 makes an excellent solution for those wanting to maximise the USB intake of their PC. Supports over current protection on each port. Provides 4 Type A Female and 1 Type B Female Connectors. Compliant with USB specification Revision 2.0. Power LED to indicate Self-power or Bus Power.